I personally have tried many different leashes and leads. I have also used a choke collars to train my german Shepherds in the past. This leash is by far the best one that I have come across. The leash has an excellent grip, which gives the handler full control, and has the cushion that you place around your dogs neck that will not allow the leash to rub against its trachea which can be damaging to your dog. I highly recommend this product. Love this dog leash. Have always hated the connect to the collar leash. Love to walk my dog with freedom to run sometimes.....this leash can be put on quickly and removed quickly. My dog is large and strong and this leash also give me the control of him when I need it. Love it thanks Dogg Boss. This leash is great. It's a collar and leash all in one and it works great! I use it on my two small dog in training. The leashes really keeps them in line, and makes leashing very easy. I love it. The quality is top notch. I highly recommend this leash. It's the only one I'll use from now on. I've tried a ton of leashes trying to get control of my 2 dogs that LOVE to pull. Anything sold at Petsmart or any other pet store I have tried, all with no improvement...none that lasts anyway! I purchased one for my bigger dog (american bulldog) and not a week later had to have one for my puggle. I can now walk my dogs without struggle!!! Will continue to HIGHLY recommend this leash to everyone with a pup. It's extremely easy, and has been life changing for us. My dog walker recommended this leash for my family. My husband has limited use of his right arm. This leash is excellent, because it allows my husband to slip the leash right over our puppy's head. It eliminated his frustration that came with the traditional leashes that attach to the color. The leash also prevents the pulling from our puppy. I originally bought this leash in Sept and now bought two more, because we like them so much. Love this Leash & Dog Boss! I purchased a hands free leash from the Dogg Boss at a pet expo and loved it. 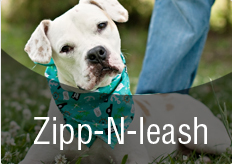 I felt that I needed the handles for more control, so I recently ordered the Zipp-n-Go Dog Leash. I received my package and there was no leash inside. I contacted Jeff at Dogg Boss and with no questions asked he put another leash in the mail to me right away. And just as I thought, I have more control with the kushee handles on the leash. This is the best leash ever! You will not be disappointed with the leash or the customer service. Thank you Dogg Boss! We started using this leash when our Golden puppy was ten weeks old. The leash is easy to put on and provides safe, humane and effective control. Even the kids find it easy to use. No more wiggly pup when it is time to leash up! Our boy is five months old now, and we still love the zipp-n-go! We also have an older Lab and the zipp-n-go works well for her,as the collar self-adjusts to the size of the dog. Can't say enough about this great and innovative leash! Absoulutley love this leash! It has been an excellent tool in training our little guy! We never have to worry about hurting him while walking or training! We don't know what we would do without it! Would definitely recommend! Our leashes and training gear, help dog owners who need more comfort, control and simplicty. We innovate, manufacture, and sell dog leadership tools and management gear. Our gear helps dog owners with training, exercising, traveling, and grooming thier dogs on a daily basis.